This 6 minute Instant Pot Potato Salad is so simple to do you will fall in love with this recipe. If you are looking for an easy side to pair with tonight’s pork chops or a potluck side dish for this summer, you just found it. The Instant Pot cooks your potatoes and eggs perfectly and all you do is toss them in and push a button. Homemade potato salad couldn’t get any easier if you ask me. We are having an early spring here in central New York. It is 68 degrees out and I am ready for cookouts already. It is going to snow on Sunday so back to winter. I wanted to test out 6 minute Instant Pot Potato Salad. Let me tell you I can’t wait for summer this was the easiest potato salad I have ever made. Done in just 6 minutes and bursting with flavor. The only thing missing was some of my Lava Cake. Sunday when it is cold out again I will be back to making soups like Panera’s copycat Broccoli and Cheddar. I create a system when I get the eggs and potatoes cooking I start prepping the other veggies and make the sauce. Then once the Instant Pot is done, allow it to cool a little and then peel and dice eggs and incorporate it all together. It literally takes minutes to make. This recipe gives you that creamy thick sauce that coats the potatoes really nicely and truly is a breeze to make. 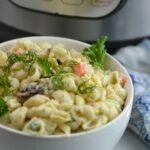 The Instant Pot potato salad is simple to make and perfect in flavor. 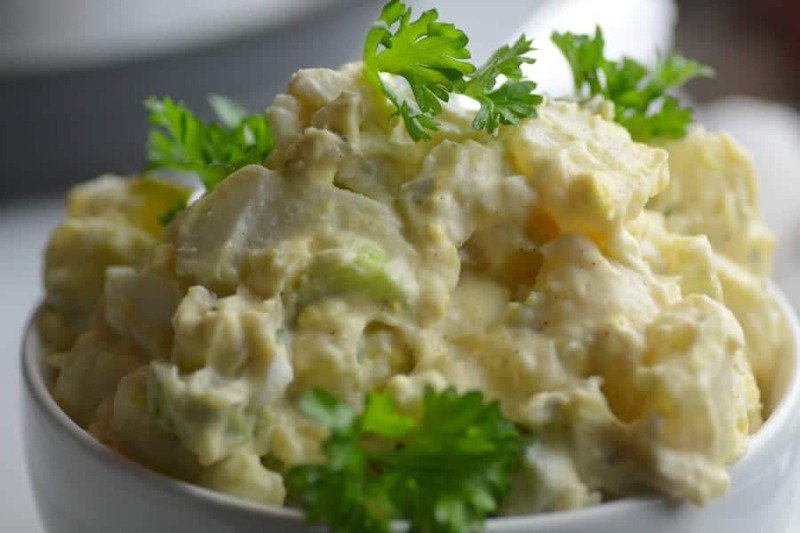 Make this in the morning before you leave for work and when you come home at night you have that perfectly chilled potato salad waiting for you. When you put the eggs on top of the potatoes it will help cook the eggs faster than say cooking solely eggs in the Instant Pot. It is a trick I learned and it really does pay off in cook time! Another thing is to be aware of how thick you slice your potatoes. The larger chunks you make the longer they need to cook. The smaller you cut the less cook time is required. I cut my potatoes into smaller bite size pieces and find the time works great. If you struggle it could be the size of potatoes. 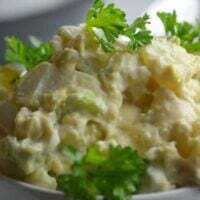 This 6 minute Instant Pot Potato Salad is so simple to do you will fall in love with this recipe. Place potatoes and eggs in a steamer basket in the Instant pot. Manual High pressure for 6 minutes. Remove and stir together Potatoes, Mayo, and spices. Place eggs in ice water for 5 minutes. Remove shells, chop and add to potato mixture. Stir and chill for one hour. Made this potato salad a couple of times and it came out perfect!! 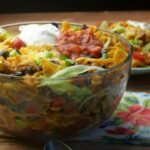 My family and extended family loved this recipe. I only made one change and that was using pickle juice instead of relish. I had to make a quick decision when I realized I was out of relish and it happened to work. 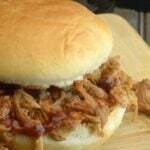 The first recipe I tried with my IP….loved it! Hubby will be so happy having potato salad more often. Thanks also for giving a measurement for the potatoes rather than a weight….I have no idea how much 2# of potatoes would translate to when we buy our potatoes by the 50# bag! Love this and love your Facebook group. Thank you so much for this!! I always manage to over cook potatoes. This is fool proof. The seasonings are spot on too. I also love that this doesn’t make a huge amount. Perfect for a weeknight. I’m going to make ribs in the IP later to go with it. Yum! Am I the only one whose potato salad turned out red from the paprika? It didn’t look like that recipe at all! Yes – to much paprika. I think 1/2 tsp would be more than enough. I also had to good the potatoes and eggs an additional 4 minutes. 6 minutes – the eggs were runny and the potatoes crunchy. I use a Fagor instant pot so that may be a difference between the two. I made this for 3 of us last week… amazing! Can this recipe be doubled using the same cook time? I doubled it, keeping the same cooking time and it came out perfect! latest methods in technology. Thanking you in advance for your help. Well, I tried this recipe using russet potatoes (Idaho) because that’s what I had on hand, but 6 minutes was way to long cook them. They were so soft that I could have made mashed potatoes. Perhaps starting at 3 or 4 minutes would have been better. It might be best to use a waxier potato like Yukon gold next time. Worked perfectly. I won’t make it any other way after this! Thanks!! I’ve made this several times and everyone loves it!! I’ve doubled it and it works perfectly. Also, I now break all my eggs in a Pyrex bowl & set on top of the potatoes. Then I just cut the cooked egg mixture into cubes & add to the recipe instead of peeling them. Works perfectly! !